Question: Should We Write a Backup Offer to Buy a Home? A reader asks: "We found the perfect home but our agent says the seller will only accept a backup offer. We don't want to be in backup. We want to buy that home. How can we make a backup offer that will give us that house? My wife says we're wasting our time, time that could be spent looking at homes to buy that don't have any offers on them. Should we write a backup offer to buy a home?" Answer: The good thing about your situation is the seller would most likely not ask for backup offers if the seller didn't feel there was a good chance the offer in hand might blow up or go away. Generally, if you're the second person in line, you might very well end up buying that home. The odds are good. But I can understand your reluctance to make a backup offer. Nobody wants to play second fiddle except second fiddle player, right? If any one of those situations hit a snag, the transaction might cancel. If the transaction cancels, then the seller would need to put the home back on the market and start showing the home again. A backup offer acknowledges the existence of an existing offer and says if the first buyer cancels, then you are automatically in contract with the seller. A backup offer stops the seller from entertaining offers from other buyers or putting the home back on the market. Once the first buyer cancels, bam, you are in contract. If prices have gone up because you're buying a rising market, you've locked in the original price in your backup offer. A backup offer needs to be signed by all parties to the contract to be effective. Sellers can sign more than one backup offer providing the seller makes the position of each party known. For example, you could be in #3 or #4 position if there are four backup offers. Ideally, you want to be in #1 position, the first back-up offer. Do Backup Offers Have to Be Higher Than the List Price? First offer: less than list price because the buyer doesn't know anyone else is interested. Second offer: List price because often the first and second arrive close together. Fourth offer to 10th offer: Somewhere in between because these buyers know it's a long shot. The seller has an incentive to stick with the first buyer's offer, especially if it's a higher offer. But you are saving the seller time and trouble by submitting a backup offer, so the seller might be willing to accept a little bit less to give you an incentive to wait. But if multiple offers are the norm, it's generally best to match the offer on the table. Talk to your agent about acceptable strategies. Don't go blindly on your own intuition. Use your agent's knowledge about the marketplace. If you are buying a home that is subject to a short sale approval, a backup offer for a short sale probably gives you odds greater than 50 / 50 that the first offer will go away. Many buyers don't want to wait for short sale approval, and any little snafu along the way can delay a short sale. The odds are very high the first buyer will not wait. 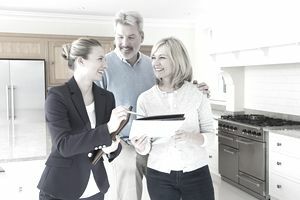 By placing yourself in a backup position, you are not obligated to buy the home, and you can still look at other homes on the market while you wait. If you find another home you like better, you might be able to withdraw your offer from consideration, but that practice is frowned upon for obvious reasons. It pretty much negates the purpose of a backup offer. However, another avenue to consider is the short sale seller and buyer might have signed a short sale addendum. If that short sale addendum allows the seller to accept backup offers and send those offers to the bank, you might be ​in a position to persuade the seller to submit your offer to the bank. If it's better than the first offer, which offer do you think the short sale bank will accept? This would effectively kick out the first buyer. Talk to your agent, though.